There is something fascinating about snow globes, no matter your age. Every year around this time they come out and it’s hard to resist shaking them up! We had snow on Sunday and we felt a little like we were living inside one of these special glass balls.. Huge snowflakes falling all around us made us glow with excitement for the season. Somehow the first snowfall is magical and the last snowfall is disgusting, I’m going to relish in the first for a few days, because it really was OH SO BEAUTIFUL! I know I know, it’s not even Thanksgiving yet, but I figured that most of the cold climates will be experiencing the first snow of the year very soon, if they have not already, and this is a great way to “celebrate” it! I traced the lid off of a sauce pan for a perfect circle and then cut them out. I used blue paper, but grey or even black might look cute too… Older kids can do this themselves… I then let the boys paint their own snowman and snowflakes with q-tips. I instructed them to use them like snowballs and paint up and down versus side to side. I also gave them toothpicks for the smaller snowflakes. Once they were dry we glued on hats (that we cut from black paper), scarves ( I used curly ribbon), and drew eyes, nose and mouths with markers… I drew a base for the snow globe and let the boys “name” their snowman. 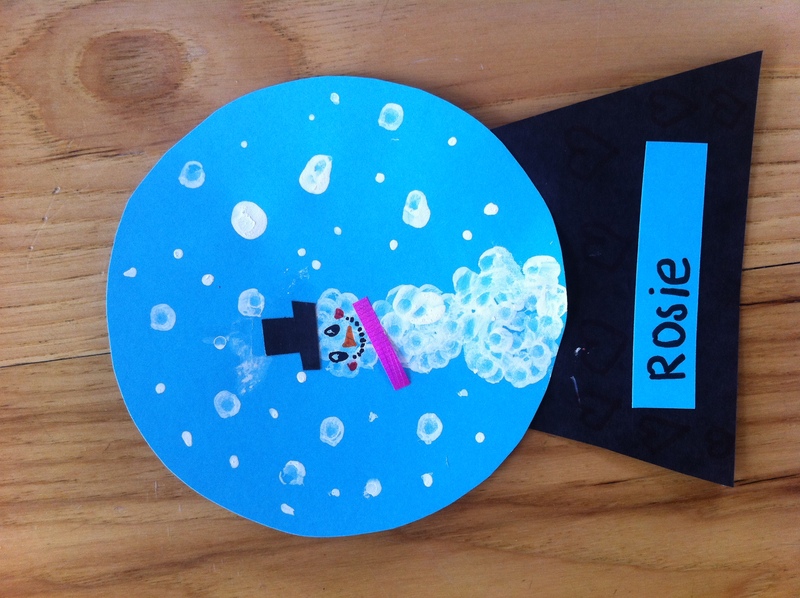 Sutton chose the name “Rosie” for his snowgal… Some of you who know him might know why :)! We added a name plate and TADA… Cute little paper snow globe! I’ve made REAL snow globes before out of baby food jars, maybe we’ll do that once we find more of our craft supplies that are still hidden in boxes! For now, I’m going to go outside and enjoy this day!